Charles Garnier was born Jean-Louis Charles Garnier on 6 November 1825 in Paris, on the Rue Mouffetard, in the present-day 5th arrondissement. His father was originally from Sarthe, and had worked as a blacksmith, wheelwright, and coachbuilder before settling down in Paris to work in a horse-drawn carriage rental business. He married Felicia Colle, daughter of a captain in the French Army. Later in life, Garnier would all but ignore the fact that he was born of humble origins, preferring to claim Sarthe as his birthplace. Garnier became an apprentice of Louis-Hippolyte Lebas, and after that a full-time student of the École royale des Beaux-Arts de Paris, beginning during 1842. He obtained the Premier Grand Prix de Rome in 1848, at age twenty-three. The subject of his final examination was entitled:"Un conservatoire des arts et métiers, avec galerie d'expositions pour les produits de l'industrie". He became a pensioner of the Académie de France à Rome from 17 January to 31 December 1849. He traveled through Greece which provided him the subject of his fourth year submission, presented at the Paris Salon in 1853. He visited Greece with Edmond About and Constantinople with Théophile Gautier. He worked on the Temple of Aphaea in Aegina where he insisted on polychromy. He was named, in 1874, member of the Institut de France, in the architecture section of the Académie des Beaux-Arts. The Palais Garnier in winter. On 30 December 1860 the Second Empire of Emperor Napoleon III announced a competition for the design of a new, state-funded opera house. The old opera house, located on the rue Le Peletier [fr] and known as the Salle Le Peletier, had been constructed as a temporary theatre in 1821. Street access to that theatre was greatly constricted, and after an attempted assassination of Napoleon III at the theatre's entrance on 14 January 1858, it was decided to build a new opera house with a separate, more secure entrance for the head of state. Applicants were given a month to submit entries. There were two phases to the competition, and Garnier was one of about 170 entrants in the first phase. He was awarded the fifth-place prize and was one of seven finalists selected for the second phase. The second phase required the contestants to revise their original projects and was more rigorous, with a 58-page program, written by the director of the Opéra, Alphonse Royer, which the contestants received on 18 April. The new submissions were sent to the jury in the middle of May, and on 29 May Garnier's project was selected for its "rare and superior qualities in the beautiful distribution of the plans, the monumental and characteristic aspect of the facades and sections". Soon the thirty-five-year-old and relatively unknown Garnier began work on the building, which eventually would be named for him, the Palais Garnier. 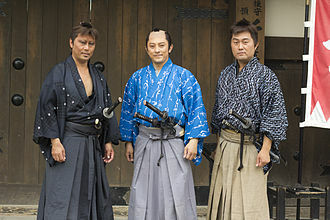 Many people had difficulty in deciding exactly what style he was trying to portray. When asked by Empress Eugénie in what style the building was to be done, he is said to have replied: "Why Ma'am, in Napoleon Trois, and you complain!" Construction began in the summer of 1861, though setbacks would delay it for another fourteen years. During the first week of excavation, an underground stream was discovered, rendering the ground too unstable for a foundation. It required eight months for the water to be pumped out, though enough was left in the area which eventually became the fifth cellar for operating the hydraulic stage machinery above. Garnier's double-walled and bitumen-sealed cement and concrete foundation proved strong enough to withstand any possible leakages, and construction continued. 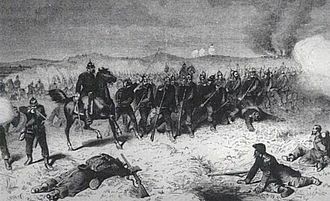 The defeat of the French army by the Prussians at the Battle of Sedan in 1870 resulted in the end of the Second Empire. During the Siege of Paris and the Paris Commune in 1871, the unfinished Opera was used as a warehouse for goods, as well as a military prison. The opera house was finally inaugurated on 5 January 1875. Many of the most prestigious monarchs of Europe attended the opening ceremony, including the President of France's new Republic, Marshal MacMahon, the Lord Mayor of London, and King Alfonso XII of Spain. The people who entered the massive building, spanning nearly 119,000 square feet (11,100 m2), were generally awed by its immense size and extensive ornamentation. Claude Debussy described it as resembling a railway station on the outside, and that the interior could easily be mistaken for a Turkish bath. Garnier's works represent a Neo-Baroque-inspired style, popular during the Beaux-Arts period in France. 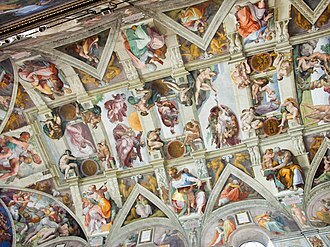 He was influenced by the Italianate styles of Renaissance artisans such as Palladio, Sansovino, and Michelangelo, perhaps the result of his many visits to Greece and Rome during his lifetime. He was also a pioneer of architectural beauty as well as function; his opera was built on a framework of metal girders, unprecedented at the time. Aside from being fireproof, steel and iron was much stronger than wood, allowing it to successfully withstand the countless heavy tons of marble and other materials heaped upon it without breaking. In 1872 and 1873 Garnier built a vacation home on the Italian Riviera, the Villa Garnier in Bordighera. He was one of the first to build there after the arrival of the railroad in 1871 and later contributed various private and public buildings to the town until his death in 1898. 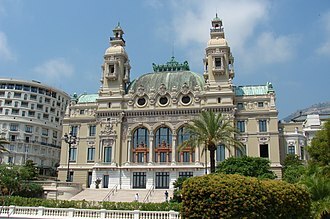 Other architectural contributions include the Grand Concert Hall of the Monte Carlo Casino (1876/79–1879; since remodeled as the Opéra de Monte-Carlo) and the Salle de Jeu Trente-et-Quarante (1880–81), both on the Place du Casino in Monte-Carlo; the Nice Astronomical Observatory (1879–88); the Cercle de la Librairie, [fr] 117 boulevard Saint-Germain in Paris (1878–80); the Hôtel Hachette, 195 boulevard Saint-Germain in Paris (1878–1881); the Panorama Marigny in Paris (1880–82); now the Marigny Theatre); and his last work, the Magasin (storehouse) de Décors de l'Opéra on the rue Berthier in Paris (1894–95; now the Ateliers Berthier of the Odéon-Théâtre de l'Europe). Garnier retired from his private architectural practice in 1896, but continued to serve on juries for architectural competitions and to appear at official functions. He suffered a stroke at 4 o'clock in the morning on 2 August 1898, while at home in Paris, and a second the following evening, dying at 8 o'clock in the evening. He was interred in the Montparnasse cemetery. After his death a public monument, completed in 1902 to designs by Jean-Louis Pascal and crowned with a copy of the bust of Garnier, which had been created by Jean-Baptiste Carpeaux in 1869, was erected west of the Rotonde de l'Empereur of the Palais Garnier. The Ateliers Berthier [fr] (1894–1898), on the boulevard of the same name, the annex of the Opéra and its fabrication workshops for decorations and storage of costumes and scenery. This building was his last realisation. The information concerning Garnier's work on the Italian Riviera is taken from the inventory of Bouvier. In 1851, alors qu'il est pensionnaire à la Villa Médicis à Rome et à l'occasion d'un voyage à Athens, Garnier s'exclame en découvrant le Parthenon : "Il n'y a pas à choisir entre les arts, il faut être Dieu ou architecte." "Les ingénieurs ont de fréquentes occasions d'employer le fer en grandes parties, et c'est sur cette matière que plus d'un fonde l'espoir d'une architecture nouvelle. Je lui dis tout de suite, c'est là une erreur. Le fer est un moyen, ce ne sera jamais un principe." ^ Mead 1991, pp. 48–50, 54–55. ^ Mead 1991, pp. 60–62. ^ Ayers 2004, p. 173. ^ Mead 1991, p. 39. ^ "Archived copy". Archived from the original on November 23, 2011. Retrieved 2012-07-19. CS1 maint: Archived copy as title (link) CS1 maint: BOT: original-url status unknown (link) Originally at website Odeon, Théâtre de l'Europe (accessed 18 July 2012). ^ Mead 1991, pp. 271–275; Leniaud 2003, pp. 160–165. ^ Mead 1991, pp. 8, 43. ^ Bouvier 2003, p. 162. Bouvier, Béatrice (2004). "Inventaires" in Bonillo et al. 2004, pp. 186–205. Bouvier, Béatrice (2003). "Catalogue" in Leniaud 2003, pp. 160 165. Kirkland, Stephane (2013). Paris Reborn: Napoléon III, Baron Haussmann, and the Quest to Build a Modern City. New York: St Martin's Press. ISBN 9780312626891. Leniaud, Jean-Michel (2003). Charles Garnier. Paris: Monum, Éditions du patrimoine. ISBN 9782858227051. Mead, Christopher Curtis (1991). Charles Garnier's Paris Opéra: Architectural Empathy and the Renaissance of French Classicism. New York: The Architectural History Foundation. Cambridge, Massachusetts: The MIT Press. ISBN 9780262132756. Wikimedia Commons has media related to Charles Garnier. Wikisource has the text of the 1911 Encyclopædia Britannica article Garnier, Jean Louis Charles. The Palais Garnier is a 1, 979-seat opera house, which was built from 1861 to 1875 for the Paris Opera. The Paris Opera now mainly uses the Palais Garnier for ballet, the Palais Garnier has been called probably the most famous opera house in the world, a symbol of Paris like Notre Dame Cathedral, the Louvre, or the Sacré Coeur Basilica. This opinion is far from unanimous however, the 20th-century French architect Le Corbusier once described it as a lying art, the Palais Garnier is a building of exceptional opulence. The style is monumental and considered Second-Empire Beaux-Arts style with axial symmetry in plan and these include very elaborate multicolored marble friezes and lavish statuary, many of which portray deities of Greek mythology. The principal facade is on the side of the building, overlooking the Place de lOpéra. Fourteen painters and seventy-three sculptors participated in the creation of its ornamentation, the two gilded figural groups, Charles Gumerys LHarmonie and La Poésie, crown the apexes of the principal facades left and right avant-corps. They are both made of gilt copper electrotype, the facade incorporates other work by Gumery, Alexandre Falguière, and others. On the left and right lateral returns of the front facade are busts of the librettists Eugène Scribe and Philippe Quinault, when the Empire fell, work stopped, leaving unfinished dressed stonework. It is covered by a 13.5 metre diameter dome, two pairs of obelisks marking the entrances of the Rotunda to the north and the south. The interior consists of interweaving corridors, stairwells and landings allowing the movement of large numbers of people, rich with velvet, gold leaf, and cherubim and nymphs, the interior is characteristic of Baroque sumptuousness. The building features a ceremonial staircase of white marble with a balustrade of red and green marble. Its design was inspired by Victor Louiss grand staircase for the Théâtre de Bordeaux, the pedestals of the staircase are decorated with female torchères, created by Albert-Ernest Carrier-Belleuse. When they were first fixed in two months before the opening of the building it was obvious to Garnier that they were too dark for the space. 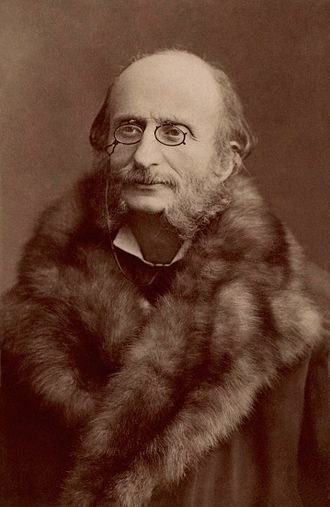 Jacques Offenbach was a German-born French composer and impresario of the romantic period. He is remembered for his nearly 100 operettas of the 1850s–1870s and he was a powerful influence on composers of the operetta genre, particularly Johann Strauss, Jr. and Arthur Sullivan. 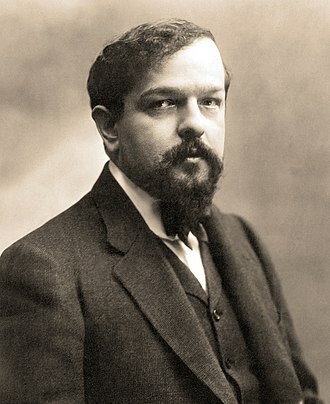 His best-known works were revived during the 20th century. The Tales of Hoffman remains part of the opera repertory. Born in Cologne, the son of a cantor, Offenbach showed early musical talent. At the age of 14, he was accepted as a student at the Paris Conservatoire but found academic study unfulfilling, from 1835 to 1855 he earned his living as a cellist, achieving international fame, and as a conductor. His ambition, was to compose pieces for the musical theatre. Finding the management of Paris Opéra-Comique company uninterested in staging his works, there he presented a series of his own small-scale pieces, many of which became popular. In 1858, Offenbach produced his first full-length operetta, Orphée aux enfers, during the 1860s, he produced at least 18 full-length operettas, as well as more one-act pieces. His works from this period included La belle Hélène, La Vie parisienne, La Grande-Duchesse de Gérolstein, Offenbach became associated with the Second French Empire of Napoleon III, the emperor and his court were genially satirised in many of Offenbachs operettas. 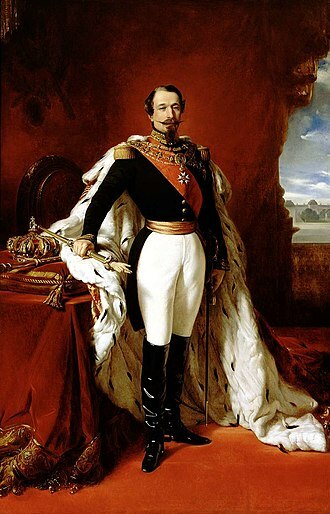 Napoleon III personally granted him French citizenship and the Légion dHonneur, with the outbreak of the Franco-Prussian War in 1870, Offenbach found himself out of favour in Paris because of his imperial connections and his German birth. He remained successful in Vienna and London, however and he re-established himself in Paris during the 1870s, with revivals of some of his earlier favourites and a series of new works, and undertook a popular U. S. tour. In his last years he strove to finish The Tales of Hoffmann, but died before the premiere of the opera, Offenbach was born Jacob or Jakob Offenbach to a Jewish family, in the German city of Cologne, which was a part of Prussia. His birthplace in the Großen Griechenmarkt was a distance from the square that is now named after him. Menton is a commune in the Alpes-Maritimes department in the Provence-Alpes-Côte dAzur region in southeastern France. Situated on the French Riviera, along the Franco-Italian border, it is nicknamed perle de la France. The Menton area has been inhabited since the era, and is the site of the original Grimaldi Man find of early modern humans, as well as remains of Neanderthals. In Roman times, the Via Julia Augusta, a road connecting Placentia with Arelates passed through Menton, running along the Rue Longue in the old town. The first major settlement occurred during the 11th century CE, when the Count of Ventimiglia constructed the Château de Puypin on the Pépin hill, Menton was thus incorporated into the Republic of Genoa. The first mention of Menton dates from 21 July 1262, in the treaty between Charles of Anjou and Genoa. Its position on the border between the Angevin-ruled Provence and the Republic of Genoa, which at the time claimed Monaco as its western limit, acquired in 1346 by Charles Grimaldi, Lord of Monaco, Menton was ruled by the Princes of Monaco until the French Revolution. Annexed during the Revolution, Menton remained part of France through the First Empire and it belonged to the district of Sanremo in the department of Alpes-Maritimes, which at the time included Monaco and Sanremo. In 1814, Menton was included in a reconstituted principality of Monaco which, after Napoleons Hundred Days in 1815, the Princes of Monaco were obliged to do homage to the King for Menton, although not for Monaco itself. In 1848, along with its neighbour Roquebrune, seceded from Monaco, due at least in part to a tax imposed on lemon exports. 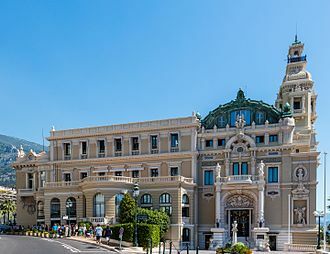 The county of Nice was thus annexed to France that June, and Napoleon III paid 4 million francs in compensation to the prince of Monaco, by the end of the 19th century, tourism was an important factor in Mentons growth. 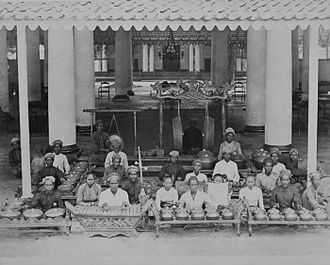 The town was popular with English and Russian aristocrats who built many of the hotels, villas. Many of these hotels and palaces were pressed into service as hospitals during World War I to allow injured troops to recuperate in a pleasant climate, Menton was the only sizable settlement captured by Italy during its invasion of France in June 1940. Montmartre Cemetery is a cemetery in the 18th arrondissement of Paris, that dates to the early 19th century. Officially known as the Cimitière du Nord, it is the third largest necropolis in Paris, after the Père Lachaise cemetery and the Montparnasse cemetery. In the mid-18th century, overcrowding in the cemeteries of Paris had created numerous problems, in the 1780s, the Cimetière des Innocents was officially closed and citizens were banned from burying corpses within the city limits of Paris. 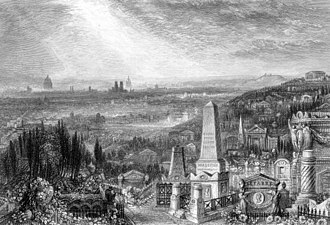 The Montmartre Cemetery was opened on January 1,1825 and it was initially known as la Cimetière des Grandes Carrières. The name referenced the cemeterys unique location, in a gypsum quarry. The quarry had previously used during the French Revolution as a mass grave. It was built below street level, in the hollow of a gypsum quarry located west of the Butte near the beginning of Rue Caulaincourt in Place de Clichy. As is still the case today, its entrance was constructed on Avenue Rachel under Rue Caulaincourt. The Battle of Sedan was fought during the Franco–Prussian War on 1 September 1870. Marshal MacMahon was wounded during the attacks and command passed to General Auguste-Alexandre Ducrot, after its defeat at Gravelotte, Marshal Bazaines Army of the Rhine retreated to Metz where it was besieged by over 150,000 Prussian troops of the First and Second Armies. Emperor Napoleon III, along with Marshal MacMahon, formed the new French Army of Châlons to march on to Metz to rescue Bazaine. The Prussians had repeatedly outmaneuvered the French in the string of victories through August 1870, the Prussians, under the command of von Moltke, took advantage of this maneuver to catch the French in a pincer grip. After a hard-fought battle with the French losing 5,000 men and 40 cannons in a sharp fight, the French withdrew towards Sedan. Their intention was to rest the army, which had involved in a long series of marches, resupply them with ammunition and retreat. 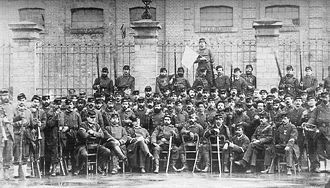 Having reformed in Sedan, the Army of Châlons deployed the First Corps to check the Prussian advance and they could not retreat owing to the exhaustion of their troops, and they were short on ammunition. The French rear was protected by the Fortress of Sedan, and offered a position at Calvaire dIlly. Moltke divided his forces into three groups, one to detain the French where they were, another to race forward and catch them if they retreated, the French were unable to move and had to fight where they stood. The Prussians thus encircled the French, Napoleon had ordered MacMahon to break out of the encirclement, and the only point where that seemed possible was La Moncelle, whose flank was protected by a fortified town. The Prussians picked La Moncelle as one point where they would mount a breakthrough, prince George of Saxony and the Prussian XI Corps was assigned to the task, and General Baron von der Tann were ordered to attack Bazeilles on the right flank. This was the engagement, as the French First Corps had barricaded the streets. Von der Tann sent a brigade across pontoon bridges at 0400 hours, the combat drew new forces, as French brigades from the First and Twelfth Corps arrived. At 0800 the Prussian 8th Infantry Division arrived, and von der Tann decided it was time for a decisive attack. Theatrical scenery is that which is used as a setting for a theatrical production. The history of theatrical scenery is as old as the theatre itself, what we tend to think of as traditional scenery, i. e. By the Shakespearean era, the painted backdrop or theatrical prop was in evidence. However, this means that todays set designers must be much more careful. Our more modern notion of scenery, which dates back to the 19th century, finds its origins in the spectacle of opera buffa. Its elaborate settings were appropriated by the straight, or dramatic, through their use in comic operettas, burlesques and the like. Everything came together in the 1980s and 1990s and, continuing to today, until there is no established style of scenic production, modern stagecraft has grown so complex as to require the highly specialized skills of hundreds of artists and craftspeople to mount a single production. The construction of scenery is frequently one of the most time-consuming tasks when preparing for a show. Modern-day rotating set for the play Noises Off.